The inductive voltage transformers which the insulation material is SF6 gas. The bushing of the voltage transformer is made by silicon rubber or porcelain. There are some aluminium electrodes inside the voltage transformer, to improve the electric field distribution inside the voltage transformer. There is a pressure relief device at the top of the voltage transformer, when the pressure is more than 0.8MPa (1.0 MPa only for 500 kV) if the voltage transformer is discharge inside, the relief device will be broken to release the pressure and send an alarm information. 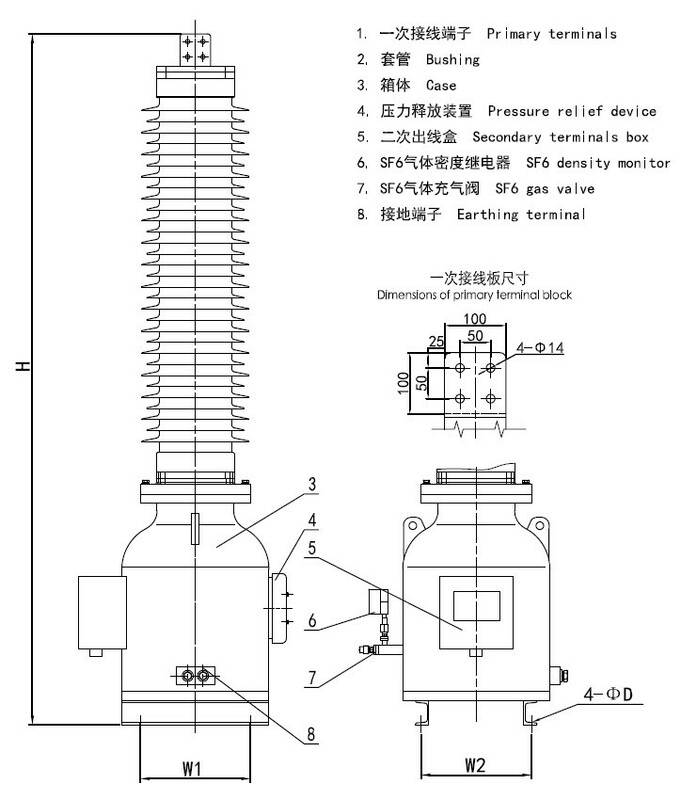 There is a SF6 density monitor fix at the base, it can indicate the SF6 pressure which inside the voltage transformer (its indicated value is the SF6 pressure at 20℃), and it will provide an information when the SF6 pressure is drop down to the minimum service pressure of the current transformer, to remind the user replenish the SF6 gas to the rated pressure. The secondary terminals block is casted by epoxy resin, the frame of the secondary terminals box is a seal structure, it suits for outdoor. Rated operating pressure of gas SF6 is 0.40MPa (0.50 MPa only for 500 kV); Minimun operating pressure of the gas SF6 is 0.35MPa (0.45 MPa only for 500 kV). Note: Each thermal limit burden for protective winding is 2000VA. Arcing distance and creepage distance of outer insulation please see table 2. Insulation requirements for the primaries please see table 3. Mechanical requirements for the primary terminals please see table 4. The outline and installation dimensions please see drawing 1, and the dimensions of the primary termanils please see table 5.